Toll, the Australian logistics and transport giant. which is now a subsidiary of Japan Post has announced it has added the first two electric vehicles to be operated by Toll Express Japan. 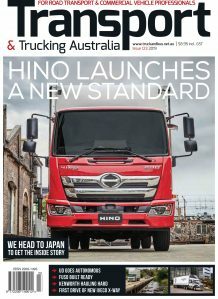 The light-duty all-electric trucks are FUSO eCanters and will operate pickup and delivery services in Tokyo. Engineered to meet demand for cleaner and quieter urban deliveries, the FUSO eCanters offer an economical and environmentally efficient supply chain solution along with added comfort and functionality for a seamless driver experience. Each of these FUSO eCanters are expected to deliver a saving of 16 tons of CO2 per year. With a payload capacity of 3 tonnes, the FUSO eCanter’s electric drivetrain incorporates six high voltage lithium-ion batteries, each storing 13.8 kilowatt hours at 370 volts. The FUSO eCanter’s top speed is limited to 80 km/h with a driving range of over 100km on a single charge. Peter Stokes, President of Toll Group Operational Services, acknowledged that it was the partnership with Daimler and the incentives on offer in Japan that made the move to electric vehicles possible for Toll Express Japan. 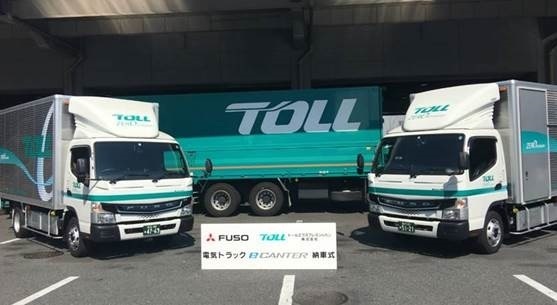 “The FUSO eCanters mark a significant milestone for us with the alignment of price, performance and the energy density of batteries in supporting adoption of this technology in Japan. We hope other markets will follow suit and we remain actively engaged with our partners towards incorporating electric vehicles into our fleet,” Mr Stokes said.